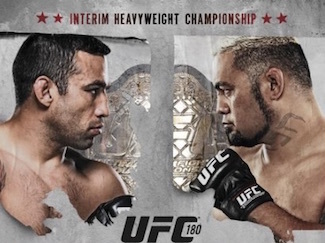 We'll kick off today's UFC 180 coverage with Fight Pass prelims at 7 PM ET, and then Peter H. will bring you a live recap of the televised fights on FOX Sports and PPV, including tonight's interim heavyweight title fight between Mark Hunt and Fabricio Werdum! Keep refreshing for the latest results. Big slam by Vera in the opening seconds but Beltran lands and tries a guillotine choke but Vera gets out and is in half guard i mean full guard i mean he takes his back. Wow that was fast, very fast. Vera is sitting against the cage behind Beltran and is looking for the choke here, though its under the chin here. Beltran is able to get the arm of Vera off his throat, Vera tries again and Beltran gets out again. Beltran gets out and is now in top position. Beltran is working from the top position and he needs to continue that if he wants to win this round. Beltran up to his feet and tries for a heel hook but after that fails gets into full mount position and is landing the elbows now. That's the end of the round, 10-9 Beltran leading to an exciting final round here. Very exciting and quick round here with Beltran ending the first half in top position but Vera missed 2 submission attempts but Beltran was just quick enough to escape. Both fighters back in the standup with 2:10 left in the round. Vera using the muai thai clinch lands a hard knee to the body and is working that position there and is in half guard landing heavy shots here. They are right up against the fence and hey it's Cain Velasquez shouting instructions from his front row seat. Vera rolling here into a darce choke. Looks like an oomaplata but Beltran escapes. Vera in half guard, Beltran trying to throw elbows off his back and theres the horn. 10-9 Vera so I have it 29-28 Vera though I wouldn't be surprised if Beltran did enough to win that one. Perfect example here of why you never leave a fight in the hands of the judges. A few fans are booing the decision but cheer when they show Cain on the big screen. Briones nickname is Bure after the Hall of Fame hockey player so you know who I'll be cheering for. Briones fought for Team Velasquez while Cannetti fought for Team Werdum. Team Velasquez goes to 2-0 on the night so far. One minute down in the round and both fighters are staying on their feet relying on their standup game so far. Benitez using some nice kicks here. Another low blow by Brown stops the fight. The replay clearly shows it was a low blow and a point has been deducted here. Halfway through the round now and Brown has Benitez against the cage. Fight is stopped with 90 seconds due to lack of activity, and here we go. Brown is relying now on shooting for a takedown and his punching game here. Fans are getting restless as Brown has been pushing Benitez up against the cage for the better part of the second half of this round. There's the horn. 10-8 Benitez due to the point deduction. Both fighters embrance in the centre of the cage and Brown has Benitez pinned up against the cage again after eating a kick but Benitez looks to have a choke here. Benitez falls on top of Brown and Brown is out cold. Velasquez is 3-0 so far tonight and we move onto oue first fight with ranked fighters. Replays are showing that her cauliflower eye was burst by one of the punches by Eye. Injury timeout here as the referee talks to the doctor. Fight will continue. Good quick pace here and the fight is stopped due to the ear opening up again. It is split open here and it's nasty. She is screaming that she wants to continue. Doctor calls the fight off. Leslie Smith is protesting to the camera but her ear is in really bad shape like it could fall off. Right call here made by the doctors but what a way to win and lose a fight. They hug before the round begins but Perez pushes him away and 20 seconds later we have a slugfest. Perez gets his back and scores a takedown into an RNC but Quinonez escapes and Quinonez is now on top and Perez is folded like a pretzel here and Quinonez is throwing some nice knees here. Quinonez trying to work in side control here and the crowd is very loud. Arm Triangle attempt here by Quinonez perhaps a kimura but that's a stretch (see what i did there) Quinonez almost in full mount here, Perez is fighting out and Quinonez hits an illegal headbutt and the fight is stopped. Very distinct headbutt by Quinonez and the doctors are being called in. Right on the nose and McCarthy is telling the judge "It was F***ing intentional" and deducts 2 points from Quinonez. Fight is back on and now if this goes the distance we might have a sudden victory round here possibly. 30 seconds left in the LA TUF BW Final and Quinonez scores a takedown here. Perez is just trying to lock Quinonez up here and Quinonez is fighting for position here, Quinonez goes for a guillotine choke here and there's the horn. I'll give that round to Perez so 10-7 (2 pt deducted from the 9 I'd give Quinonez) So 28-27 Perez is my score but let's see what the judges say. No doubt about it, that headbutt was the turning point in the fight. Can Team Velasquez make it a clean sweep tonight? Only time will tell, in fact let's find out right now. Both fighters embrace to start the round and here we go. Morales starting to land a few nice shots and including a low blow and that was accidental but painful at the same time. Rodriguez is on his back trying to I guess shake off the kick ...anyways back to the action. Rodriguez now with the momentum and this round is for all the marbles and both fighters are looking to end it before the horn goes. The crowd starts to wake up and is chanting for Rodriguez and another low blow but this one was by Rodriguez and the fans are cheering this. Both fighters are throwing a flurry of punches and Rodriguez now has Morales pinned against the cage. Back to centre and Morales throws Rodriguez down but he gets right back up. Rodriguez is bleeding from his right eye due to an accidental headbutt. Both fighters in the centre of the cage here just standing there getting their timing down Morales is going for a flurry and there's the horn. 10-9 Morales but 29-28 for Rodriguez on my card. The judges agree and we move onto the PPV Fights and also it's a clean sweep for Team Velasquez. Slow pace to start with Garcia getting a takedown early, gets the hooks in and took the back easily. He's working for the RNC and loses it and Urbina is now in top control here and is working for a guillotine here. 2 minutes left and its now ana anaconda attempt, both fighters on their feet and Urbina is now against the cage. Urbina reverses the momentum tries for another anaconda choke and its in deep and its all over. Montano is the hometown guy here and Heatherly is trying to play spoiler here. Heatherly scores a takedown early but both fighters are very active on the ground here. Heatherly goes to side control and now both fighters are back on their feet. Montano now has Heatherly against the cage with 2 minutes left in the round. Now both fighters are slugging away and both are still good to go after taking a moment to regain their composure. Heatherly shoots for a takedown but Montano reverses it into a takedown himself. Montano working an anaconda choke here but lets go and both are back to their feet. Montano has Heatherly against the cage and is throwing some vicious knees here, Heatherly is in trouble but he is not defending properly and John McCarthy has stopped the fight. I thought we were going to a 2nd round until Montano poured in on with 30 seconds left and left 10 seconds left on the clock to spare. Bermudez pins Lamas against the cage within the first 30 seconds of this fight. We go back to the centre of the cage and either a slip or a kick gives Lamas the advantage via a headlock from the knees and Bermudez looks for a pickup into a slam but stops when he gets to his feet. Bermudez is now pinned against the cage with 2:15 left in the first. Looks like we are getting a standup battle here and Lamas drops Bermudez with a punch and he goes in for the kill with a guillotine choke and Bermudez is trying to fight out of this but he tapped out. Lamas now in a 5 way tie for 2nd place in most finishes in the division, Dustin Poirier leads the pack with 5 finishes. Both fighters are very cautious in the early going, both respectful of each other's power. Gastelum scores a takedown with two minutes left, very rare to see him on his back. 90 seconds left and they are both back on their feet. Gastelum has the momentum right now and has Ellenberger against the cage with less than a minute left. Very slow and methodical pace to this fight, Ellenberger goes for a slam, Gastelum reverses it and takes Ellenberger's back and with a blink of the eye Gastelum sneaks in a RNC and rears back and Ellenberger is forced to tap out. 3 way tie now for longest winning streak that Gastelum is apart of now, Neil Magny leads that stat with 5 straight wins. Here we go, I have a feeling this won't go 5 rounds. Both fighters show off their kicks early. Hunt rocks Werdum early but Werdum gets up before Hunt can advance. Werdum goes for a takedown but Hunt escapes the attempt. Hunt goes for a punch and takes down Werdum but right into Werdum's guard. Hunt trying to land some shots but Werdum is right against the fence. Werdum is controlling the left arm of Hunt. Hunt escapes the guard with a minute left. Hunt hits an uppercut to Werdum with 30 seconds left. There's the horn and it's very close but I would say 10-9 Hunt. Sad to say this but my report crashed on me but from what I can salvage, Hunt eats a knee from Werdum and Hunt goes down hard and after some unprotected GNP from Werdum, Herb Dean has no choice but to waive this fight off.